Huckleberry Hill Bed and Breakfast is a bed and breakfast located in Sandpoint, Idaho. The inn is focused on providing an ideal base for any type of North Idaho adventure, allowing vacationers and adventures to enjoy local lakes, skiing, and hiking trails. 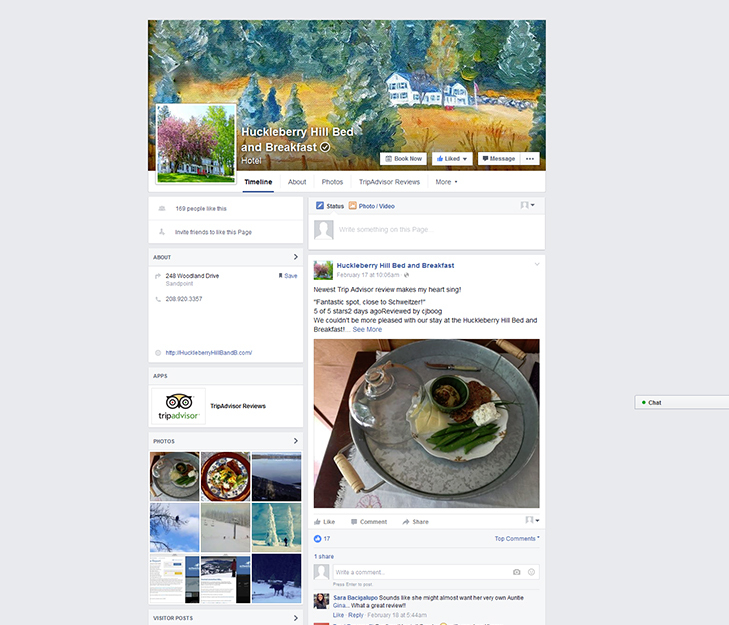 Huckleberry Hill Bed and Breakfast needed a Facebook design that best represented their inn. We put together a design which included a picture of the bed and breakfast itself and an image which incorporates the beauty of the surrounding landscape. Those who visit the Facebook page learn more about this destination while viewing the place they may want to stay at in the future. Take a look at the Facebook page here.